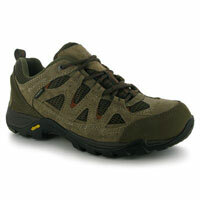 The Kalahari from Karrimor is a good looking, very flexible, low cut walking shoe. True to size and and with a decent footbed/sole system, they've been very comfortable to wear even in some unusually hot UK summer weather. They are also waterproof and with the 2mm lugged sole I've found them to be fine on wet grass and/or mud. Overall I've enjoyed wearing them for general leisure and low level walking. Whilst Karrimor's Kalaharis are too flexible for mountain walking or walking over rocky terrain, consider them for wet weather and/or warm conditions on low level paths where there's not too much rockiness - canal towpaths, converted railway lines (such as the Tissington or High Peak trails), forest walks. They are also a good option for general leisure wear if you need something that's comfortable, waterproof and breathable.